Last weekend, I was lucky enough to go skiing with my friends. Even though it’s almost spring, the log cabin, the open fire and the snow outside inspired me to create this (kinda retro) beanie crochet pattern. I never used to be a big fan of pom poms, but recently I’ve started finding them rather cute. On a recent visit to Germany, my grandmother gave me her old pom pom makers which sealed the deal. 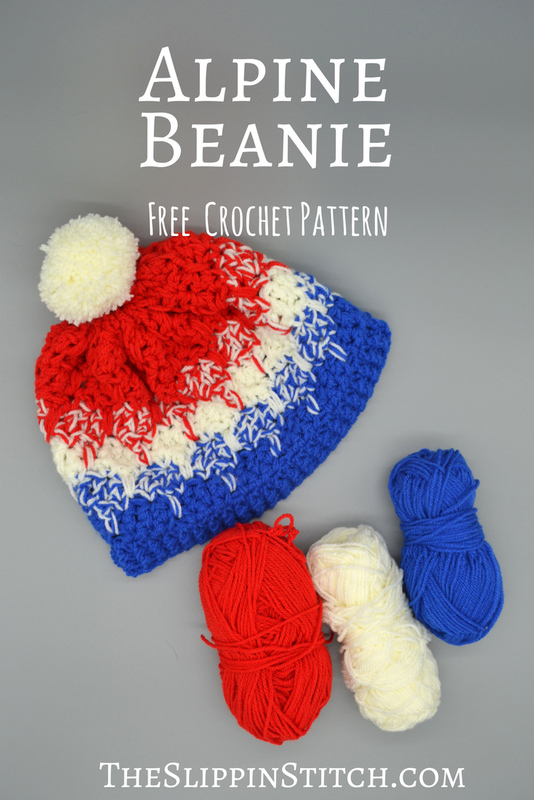 So here it is, the pom-pom-tastic alpine beanie crochet pattern! This beanie is worked crocheting with two strands of yarn at the same time (apart from the brim). The easiest way is to have 2 skeins of each colour if you have them available. If not, simply roll part of one skein into a ball. Unless otherwise specified, use 2 strands. This beanie fits most adults. If you need to adjust the size, simply start with a shorter or longer chain. Just make sure you chain multiples of 4 stitches, then add 2 chains at the end. I learned this stitch – the Mirror Stitch – from this Crochet Stitch Dictionary which I use all the time. It has photos and illustrations if you find those easier than written patterns. ROW 1a :sc in 2nd ch from hook, sc in next st, *ch1sk1, sc in next 3 st* repeat until end finishing the last set on 2sc instead of 3. ROW 4: ch 3, skip first sc, *dc in next 3 st, ch1sk1*, repeat until end, dc in last st instead of ch 1. ROW 1b: ch1, sc in next 2 st, ch1sk1, *sc in next st, tr in ch1 space from first row, sc in next st, ch1sk1* repeat until end finishing on 2sc. Moving to the top, take the long tail of red in your yarn needle and weave through the top of the stitches of the last row. Pull tight to close the top of the beanie. Make sure you make a secure knot so that the top doesn’t come undone. Turn beanie right side out (so that the seam is on the inside). You’ll be attaching the brim to the bottom (blue) of the tube you just made. Take your 4mm hook and a single strand of blue and sl st it to the first chain next to the seam. ROUND 1: ch 2, 2dc in each ch all the way around. I ended up with 48 dc. 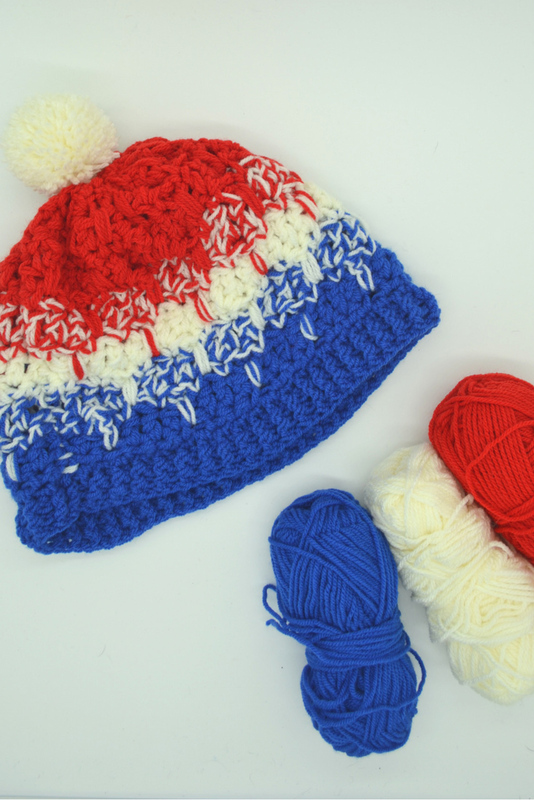 Use a Pom-pom Maker to create a pom pom in the colour of your choice. I hope you enjoy your beanie !